Joanne and I had our 14th Wedding Anniversary last week, and we've made a tradition of taking a long weekend to celebrate. It's usually a trip over to Ketchum for some mountain biking/hiking/swimming/dining, but the big Castle Rock fire last month closed most of those trails. 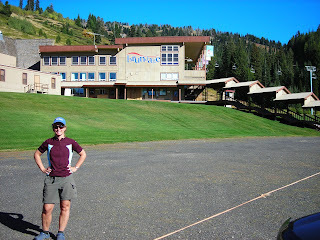 So, in Huck Finn style, we decided to strike out for new territory: a "Tour de Idaho," with stops in McCall, Tamarack and Boise before returning home to Driggs. 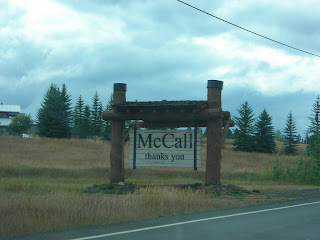 I'll make each stop a separate post, beginning here with McCall. 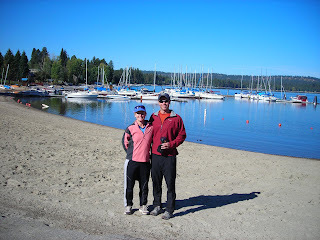 We had heard a lot about McCall and how beautiful it is, but neither of us had ever been there. 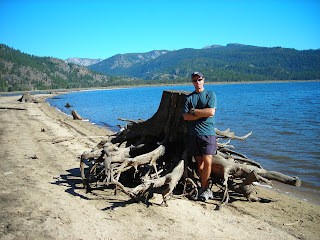 Situated on the southern shore of Payette Lake, it's 100 miles straight north of Boise, which doesn't sound bad. 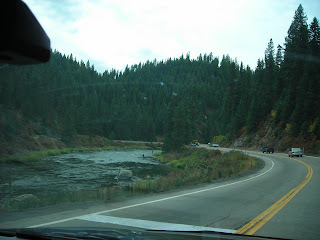 But, they are 100 very twisty-narrow-high-traffic-car-sick-along-the-Payette-River-miles. We were ready for the hot tub once we finally arrived at the Hunt Lodge in McCall. In all, it was an 8-hour drive from Driggs, a bit more of a journey than we'd bargained for. But, we were happy to be there and ready to explore. Curiously, we noticed a large number of firefighting signs, command centers, equipment and personnel on the drive. 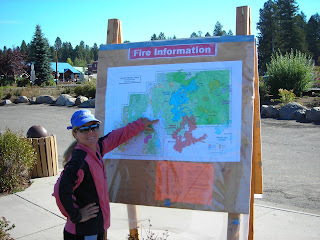 We soon learned that over a million acres of forest was burning to the north and east of McCall. That's a lot of forest. 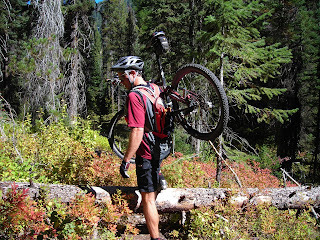 The weather forecast was perfect for the first day, so we wanted to take advantage by mountain biking an IMBA (International Mountain Biking Association) "Epic Trail": Loon Lake, a 21 mile loop consisting of serene backcountry singletrack. Off we went to a local bike shop, excited to get new maps and information. The excitement was quickly quelled upon learning the Loon Lake trail was closed due to fire. Doh!!! So, we went to Plan B and headed up Lick Creek road to the "East Fork" trail for a nice ride. Well, it was nice once we quit carrying our bikes and found the actual trail. Colors were starting to emerge in the high country, and temperatures were absolutely perfect. The camera died near the top of the ride, of course, so we missed out on photos at the very scenic turn-around spot. Doh! again. Trust me: it was a high alpine cirque with fall colors, a crystal clear creek, and an abundance of perfect granite boulders for our lunch break. The descent back down was glorious. The sky was that brilliant, unique Indian Summer blue. 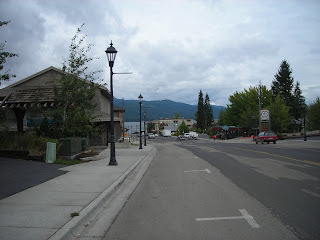 Some quick, final McCall observations: smaller, less developed yet more expensive than expected; lots and lots of trees; great lake and water scene; very low-key unpretentious locals; big hockey arena on prime main street property; elevation about 5,000 feet (1,200 feet lower than Driggs).